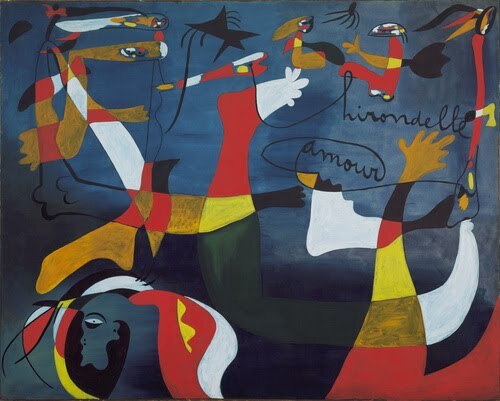 Modern Art 2011: "Hirondelle Amour"
This painting is called "Hirondelle Amour" and its by Joan Miro. The painting is a oil on canvas and its size is 6'6 1/2 by 8'1 1/2. Joan Miro is a surrealist painter. I don't know what Hirondelle Amour means but amour means love. So I am figuring the painting is something about love. You can see some faces in the painting and some feet. Not really sure what the figures are in the painting. I am partial about how I feel about the painting. Part of me likes the painting. I like that I don't know what is going on and I have to try to figure out what is going on in the painting. I also like the colors that was used too. But, the other part of me doesn't like the painting because I don't know what is going on in the painting. Maybe if I knew what the painting is about I will like it.